With all the hype surrounding the 2016 Toyota Mirai, consumers are asking questions about the validity of a fuel cell vehicle. A vehicle fueled by one of the most abundant elements in the universe that only emits water and fills up in five minutes? This may sound like a fairytale but once you understand the concept behind the Toyota Mirai, you’ll wonder why you haven’t considered purchasing one. When you pump hydrogen into the 2016 Toyota Mirai, the gas travels to carbon-fiber fuel tanks which stores up to 11 pounds. The intake grill then sends oxygen to the fuel cell stack which results in an electric reaction. When you press the gas pedal, that electricity is sent to the motor, allowing the Mirai to travel 300 miles off of one tank. The battery in the Toyota Mirai is made of nickel-metal hydride and only uses excess energy during ignition and acceleration. In conclusion, electrons and ions come together with oxygen in the fuel cell to produce water vapor instead of the harmful gases emitted by traditional cars. 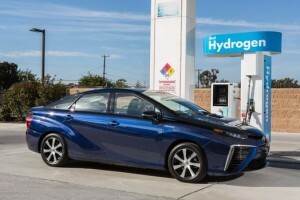 Hydrogen cars have proven to travel farther and restore range faster than most electric vehicles which requires less time “filling up.” Living in California offers an additional advantage because of the numerous filling stations readily available and more are expected to be built in the upcoming months. When it comes to actually fueling your car, all you do is attach the nozzle to your car which will snap in place. The hydrogen then begins to fill your vehicle with only a faint hissing noise. The entire process only lasts about 3 to 5 minutes. Experts at the Department of Transportation and Society of Automotive Engineers have assured us that the technology is 100% safe. Fuel cell vehicles are required to have a large hydrogen storage tank that not only holds up to 10,000 psi but is said to withstand “bonfires” and “gunshots.” There are also strict guidelines set on the temperatures and pressures at which gas is released that is said to be below the standard of safe operating conditions. Why Choose the 2016 Toyota Mirai? 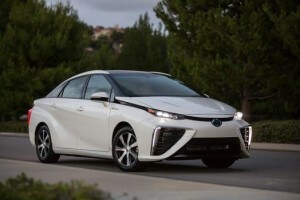 The 2016 Toyota Mirai is breaking boundaries in the world of fuel cell vehicles. The vehicle’s 153 horsepower and 247 lb-ft of torque allows it to go from zero to sixty mph in just nine seconds. The 2016 Toyota Mirai also boasts an aerodynamic exterior styling and a luxurious interior built for maximum comfort. 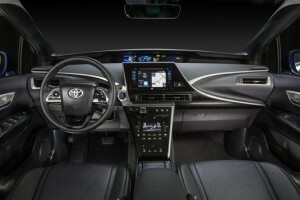 After viewing the premium audio system with Navigation, JBL, and Entune App Suite, it’s clear that the hydrogen fuel cell is not the only thing that is technologically advanced about the Mirai. It is also built with noise-reducing glass in the windshield, driver-side, and passenger-side windows. The 2016 Toyota Mirai will appear in dealerships by the end of this year with an MSRP starting at $57,500. Visit Marina Del Rey Toyota for more information on the newest Toyota models or take a look at our frequently updated online inventory for great deals every day!